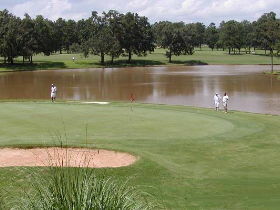 Ft Mill golf club is a Ross and Cobb design. Tee to green course was in best shape I have ever seen. Greens rolled true at medium to fast pace. Fun course to play and best value for your dollar. Proshop staff is always friendly. We teed off at 2pm on a Monday afternoon. There were very few other golfers on the course, so we played at a relaxed pace. The course was in OK shape. Yes, there were some problem areas and some of the greens had a bit of weed infestation, but it's a public course. If you're expecting Charlotte Country Club type conditions, you've set yourself up to be disappointed. To me, it was as good as most public courses in the area. Of course some are much better - Skybrook, Verdict Ridge, but there are plenty that are worse. So for my $46, I feel it was worth the drive down I-77.